The inability mute audio playing tab was one of the main missing features of Edge browser. Microsoft partially addressed this issue by adding a way to mute Edge tabs with the Fall Creators Update for Windows 10. In Windows 10 Fall Creators Update, there is a way to mute Edge tabs, but you need to open the Volume Mixer to do so. As you know, all third-party web browsers offer an option to mute a tab with a click. This feature is missing in Windows 10 Fall Creators Update. However, with Windows 10 April 2018 Update (version 1803), Microsoft has added two new ways to mute Edge tabs with ease. Just like Chrome and Firefox, Edge now supports muting a tab playing audio by simply clicking on the volume icon on the tab. You can unmute the tab by clicking on the sound or volume icon on the tab again. In addition to that, you can also mute or unmute a tab using the context menu or right-click menu. To mute a tab playing audio, right-click on the tab and then click Mute tab option. Similarly, you can unmute the tab by right-clicking on the tab and then clicking Unmute tab option. Note that the mute or unmute option doesn’t appear if you right-click on a page. You must right-click on a tab to see the option. As said, this new feature is part of Windows 10 April 2018 Update, and users will have to update their PCs to version 1803 to get this feature. 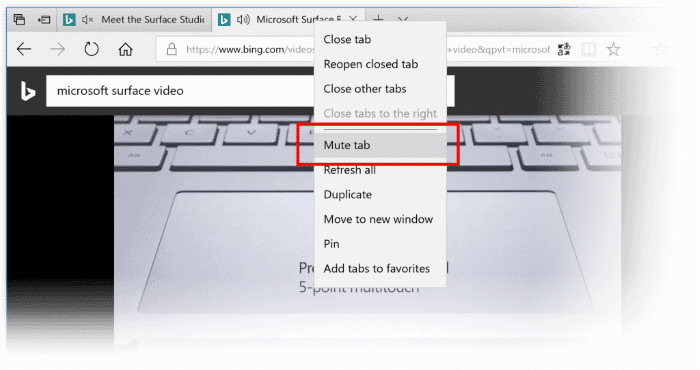 With this new tab muting feature, Microsoft Edge browser makes it easy to mute annoying video and audio that load automatically when you load some websites. If you are using Windows 10 Fall Creators Update, please refer to our how to mute Edge tabs in Windows 10 guide.